Wave Dragon model of overtopping terminator. Credit to Giovanna Bevilacqua. Overtopping terminators, also referred to just as terminators, are devices that take advantage of wave energy to generate electricity. Scientists have been doing research since the 1990s to develop overtopping devices, but not until recently has significant progress been made (Bevilacqua & Zanuttigh, 2011). 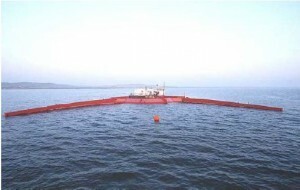 The overtopping terminator is a large device that is categorized as a wave capturer. This means that instead of using a wave’s kinetic energy to generate power like other wave energy devices, the terminator captures waves and takes advantage of their potential energy (Katofsky, 2008). In fact, the terminator got its name because of the way it absorbs or “terminates” all of a wave’s power. (Bedard et al, 2010). Offshore versus onshore overtopping terminators. Credit to Giovanna Bevilacqua. Plans have been proposed to install overtopping terminators both on and offshore. However, after Demark made great improvements with the offshore model it became the primary method of development and the onshore method’s progress diminished (Bevilacqua & Zanuttigh, 2011). 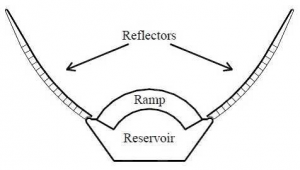 Now overtopping terminators are described as large, floating reservoirs with ramps and reflectors extending off the end and turbines located at the bottom of the reservoir. The terminators are up to 390 meters wide and can hold between 1,500 and 14,000 cubic meters of water. The average cost to build and install one of these devices is a steep $10 to $12 million but its high efficiency makes it worth the cost in the long run (US Dept of Energy, 2009). When waves first approach an overtopping terminator, they bump into its reflectors. These reflectors are attached to the main body of the floating device and are angled outward in order to direct as much wave energy up to the device as possible. Overtopping terminator aerial view. Credit to Giovanna Bevilacqua. The reflectors gradually rise in height and compress in width, leading the water all the way up to the reservoir. 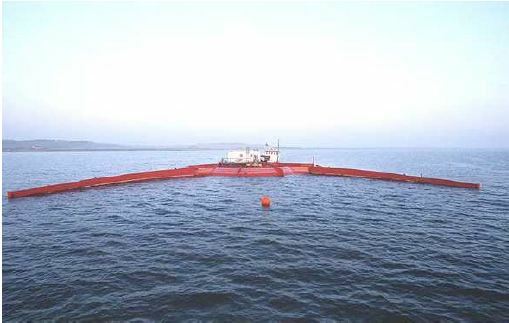 The overtopping device receives the incoming waves at their maximum heights due to the placement of the ramp, which is shallow enough to cause the incoming waves crash over into the reservoir – hence the name “overtopping” terminator. The reservoir is located at a height slightly above sea level to increase the amount of potential energy it contains (Czech, 2012). Once the water is captured in the reservoir, it is released back into the ocean via a turbine outlet located near the middle of the device. The turbines are coupled to generators to produce energy (EPRI, 2007). An animated visual provided by Lindoe Offshore Renewables Center provides a great side view of how the waves enter the overtopping terminator’s reservoir. Wave Dragon devices are the most widely known overtopping terminators and several projects are located in waters off the coast of Wales, Portugal, and Denmark (Wave Dragon, 2005). Full sized units are constructed with concrete and steel, weigh 22,000 tonnes, and cover a span of 260 meters. The Wave Dragon is located in water more than 25 meters deep in order to take advantage of ocean waves with the highest amount of energy. A pressurized system of air chambers allows the Wave Dragon’s height to be adjustable which also increases the amount of energy the device is capable of capturing with their 16-20 turbines that spin as water is released from the reservoir. Depending on wave activity, each unit has a rated power of 4-10 MW (Bevilacqua & Zanuttigh, 2011). The prototype that was launched off the coast of Denmark in 2003 has generated more than 20,000 hours of electrical power and continues to contribute today (US Dept of Energy, 2009). Some concerns about overtopping devices include the equipment’s cost, maintenance, and productivity. High prices are applicable to all renewable energy devices and hopefully with more time and better developments, appropriate funding will be available. Money is also necessary to maintain terminators, especially the floating devices which are subject to high-energy waves in the open ocean. Maintenance can be challenging but is extremely important for the safety of the equipment and its surroundings. Productivity is not so much a concern anymore since these specific projects do not rely on wavelength, do not reflect energy, and harness close to 100% (Intellegent Energy, 2010). Environmentally, these devices take up a huge amount of space on top of the water which may interfere with natural habitats and migratory pathways. Research should be conducted to decide on appropriate locations for installation and it is necessary that the water’s condition is closely monitored once the units are operating to allow maximum energy generation with minimum environmental concerns. Only about 7 percent of the wave energy devices currently being developed are overtopping terminators (Houle & Bedard, 2011). Terminating devices now range from 1.5 to 12 MW and will continue to be tested for potential improvements over the next years (US Dept of Energy, 2009). Developments from these devices in conjunction with other equipment advancements are used in other energy generating devices such as a dual-float system containing an oscillating buoy and floating harbour (You et al, 2012). Several other wave energy devices aim to terminate waves and use their energy; however none of them operate like the overtopping terminator, utilizing a wave’s potential energy. Hopefully, we will see the terminator and other advancements take off in the near future to aid in our energy production. Bedard, Roger, Paul Jacobson, Mirko Previsic, Walter Musial, and Robert Varley. “An Overview of Ocean Renewable Energy Technologies.” Oceanography 23.2 (2010): 22-31. 2010. Web. 12 July 2012. Bevilacqua, Giovanna, and Barbara Zanuttigh. “Overtopping Wave Energy Converters: General Aspects and Stage of Development.” (2011): n. pag. University of Bologna, 2011. Web. 24 July 2012. <http://amsacta.unibo.it/3062/1/overtopping_devicex.pdf>. Czech, B., and P. Bauer. “Wave Energy Converter Concepts: Design Challenges and Classification.” Industrial Electronics Magazine, IEEE 6.2 (2012): 4-16. IEEE Xplore. Industrial Electronics Magazine, June 2012. Web. 15 July 2012. <http://ieeexplore.ieee.org.libproxy.lib.unc.edu/stamp/stamp.jsp?tp=&arnumber=6218282>. Electric Power Research Institute. “Primer: Power from Ocean Waves and Tides.” EPRI (2007): n. pag. Web. 22 July 2012. <http://www.snopud.com/site/content/documents/tidal/tidalprimer.pdf>. Intelligent Energy. “Wave Energy; State of the Art, Non-technical Barriers and Best Practices.” Wavepalm (n.d.): n. pag. Wavepalm. Eve. Web. 22 July 2012. <http://www.waveplam.eu/files/downloads/waveplam.pdf>. Katofsky, R. “Ocean Energy: Technology Basics.” Renewable Energy Focus 9.3 (2008): 34-36. Science Direct. 20 May 2008. Web. 15 July 2012. <http://www.sciencedirect.com.libproxy.lib.unc.edu/science/article/pii/S147108460870091X>. US Department of Energy. “Ocean Energy Technology.” (2009): n. pag. National Rnewable Energy Laboratory. Federal Energy Management Program, 2009. Web. 24 July 2012. <http://www.nrel.gov/docs/fy09osti/44200.pdf>. Wave Dragon. Wave Dragon, 2005. Web. 19 July 2012. <http://www.wavedragon.net>. You, Yage, Songwei Sheng, Bijun Wu, and Yunqi He. “Wave Energy Technology in China.” Philosophical Transactions of the Royal Society 370.1959 (2012): 472-80. 28 Jan. 2012. Web. 15 July 2012. <http://rsta.royalsocietypublishing.org.libproxy.lib.unc.edu/content/370/1959/472.full>.